I think it is not easy for students to find out what they want to do in the future during their three years in high school. In fact, I could not find what I really wanted to do in the future when I was in high school. In my case, I only had a vague idea about studying abroad, and I could not imagine what my future would be like. The reason why I was interested in studying abroad was that I had a lot of opportunities to meet foreign people when I was a child. Even though I had been thinking about studying abroad since my childhood, I was not brave enough to leave Japan. I was worried about the completely different environment and lifestyle abroad and how I would adjust my life there. However, one day, while I was doing some research on the internet, I found Lakeland University Japan (LUJ), and at that moment, I felt this would be the perfect school for me to study English in Japan. There are two reasons why I decided to enter this university. First, LUJ has the perfect environment that can help students improve English communication skills. When I was in high school, I could not speak English fluently or even talk about daily activities in English. However, at LUJ, all classes are conducted in English and all students study in English. Students who do not have sufficient English language skills can improve their skills through the English for Academic Purposes (EAP) program. In my experience, by studying in the EAP program, I was able to gain confidence in my English language skills. After completing the EAP program, students can take various classes in the Academic program in which they are interested. Secondly, students can experience cultural diversity at LUJ because there are students from different countries, who can share their different values and cultural differences. 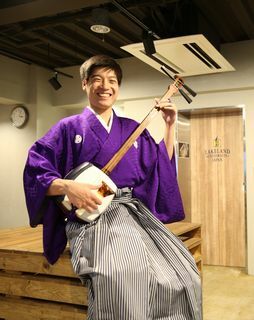 Although LUJ is located in Japan, students can experience a special life that people normally cannot experience in Japan. I can say LUJ is the place where students can have opportunities to fully experience almost the same environment as they can in English-speaking countries. Now, the world is globalized, so by being able to understand foreign people's values will help us all to behave more correctly in the future. In all honesty, I believe that through my time spent here at LUJ, I have felt my perspective changing. When people try to find a university, they firstly think about a major, but it could be hard to decide what major perfectly fits them. At LUJ, students can discover what they want to do in the future through the various courses provided in the Academic program. To be honest, I am still thinking what I should do in the future, but I have realized here at LUJ that it is not easy to decide or plan for the future, rather everyone should take time to think deeply about planning for their future. For me, LUJ is a place where I can interact directly with many people, I can feel and learn different values, and improve myself with the friends I have made here. I am sure that deciding to enter LUJ will be a remarkable first step for anyone who wishes to study here and aims to bring a change not only in the world but also within themselves.